While looking through my stash of seed beads for a color close to purple, I came across a huge bag of clear crystal filler beads used to make faux icicles. 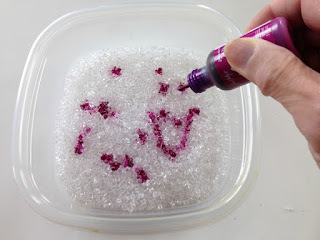 I wondered what would happen if I applied drops of alcohol ink to the little crystals. And I soon found out! By adding several drops of plum alcohol ink . . .
and shaking the container until the color was blended. Then I took a paper mache egg . . . Sprinkled on some glitter and then spread silicone adhesive over the egg and added the pretty color crystals. This photo doesn't show how lovely the crystals really are on the egg. 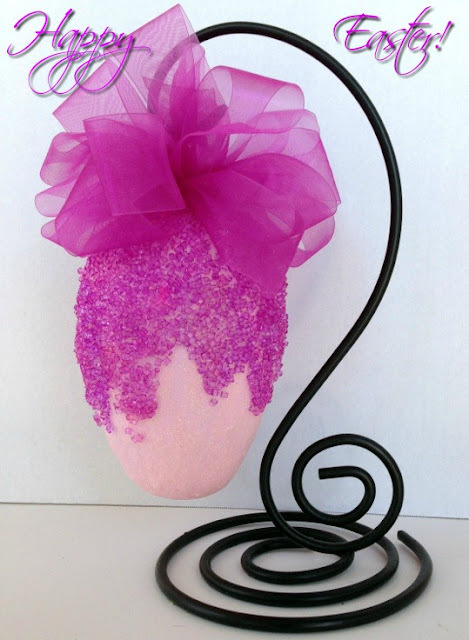 And then I thought how gorgeous the egg would look if I added a bow to the top . . . So I got out my Bowdabra and made a very fluffy bow! And glued it to the top . . . I tied the bow ribbon on . . .
and wow! Take a look! Hi Gail, that looks beautiful! Hi Gail, that is a beautiful egg, even if you say last minute. Love the stand too. Happy Easter. It looks gorgeous Gail! Happy Easter! So pretty! I realize how big the egg is when you hung it from the banana holder. What a unique idea Gail. The alcohol ink on the beads is genius. Happy Easter! Very pretty Gail. And you were able to use up all of your little icicles plastics. The bow on the top is a real show stopper! Happy Easter!